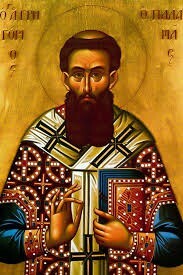 Saint Gregory Palamas was from Asia Minor and was reared in the royal court of Constantinople, where he was instructed in both religious and secular wisdom. Later, while still a youth, he left the imperial court and struggled in asceticism on Mount Athos, and in the Skete at Beroea. He spent some time in Thessalonica being treated for an illness that came from his harsh manner of life. He was present in Constantinople at the Council that was convened in 1341 against Barlaam of Calabria, and at the Council of 1347 against Acindynus, who was of like mind with Barlaam; Barlaam and Acindynus claimed that the grace of God is created. At both these Councils, the Saint contended courageously for the true dogmas of the Church of Christ, teaching in particular that divine grace is not created, but is the uncreated energies of God which are poured forth throughout creation: otherwise it would be impossible, if grace were created, for man to have genuine communion with the uncreated God. In 1347 he was appointed Metropolitan of Thessalonica. He tended his flock in an apostolic manner for some twelve years, and wrote many books and treatises on the most exalted doctrines of our Faith; and having lived for a total of sixty-three years, he reposed in the Lord in 1359. His holy relics are kept in the Cathedral of Thessalonica. A full service was composed for his feast day by the Patriarch Philotheus in 1368, when it was established that his feast be celebrated on this day. Since works without right faith avail nothing, we set Orthodoxy of faith as the foundation of all that we accomplish during the Fast, by celebrating the Triumph of Orthodoxy the Sunday before, and the great defender of the teachings of the holy Fathers today. When Thou didst descend unto death, O Life Immortal, then didst Thou slay Hades with the lightning of Thy Divinity. And when Thou didst also raise the dead out of the nethermost depths, all the powers in the Heavens cried out: O Life-giver, Christ our God, glory be to Thee. Today is the prelude of universal joy; let us keep the forefeast in gladness. For, behold, Gabriel cometh with fear and wonder unto the Virgin, bringing her the good tidings: Rejoice, thou who art full of grace; the Lord is with thee. O Gregory the Miracle Worker, light of Orthodoxy, support and teacher of the Church, comeliness of Monastics, invincible defender of theologians, the pride of Thessalonica, and preacher of grace, intercede forever that our souls may be saved. At the great Archangel’s voice, O Theotokos, the All-holy Spirit came upon thee and thou didst conceive Him that is one in essence and throne with God the Father, O Adam’s recovery. First of all, O Lord, the sons of thy servants, and the work of thy handmaids, are abolished, and dwell therein, and every one of them is aged, and all these things are changed, and they are changed, and it is he that dwellest thee occlusion. Do you know the angels of the angels for ever, even from my right hand, so that your enemies are able to stand against your feet? What are all spiritual spirits, ministry of salvation sent by the future? By doing so, they are most concerned about listening to, or even writing. Did the word of the angel of the word be assured, and did he offend, and did he receive a trespass, how did we save ourselves from those who had lost their salvation? That the LORD hath been glorified by the glory, that he hath been assured of the sons of the dead. Nicolas George Davros (6 months) son of Nicoleta and George, brother of Georgia, brother in law of Mark Passino, husband of Ericka, father of Cristina, Nasir and Sincere, nephew of Yianni & Maria Panageotou, cousin of George, Peter & Christos, aunts, uncles & cousins. James George Mellides (1 yr) survived by his parents Katie & Ted, brother Michael, nephew Daniel, great uncle James, aunt Merle (Erin & Eamon), uncle Peter, aunt Joanne, and dear friends & cousins. Robyn Pappas (2 yrs) survived by her husband Andrew Pappas, siblings Bob (Joan) Ostberg, Judith Collias, Bobbie (Ed) Isom, Bill Shadley and sister in law Betty Pappas. Dr. George Mehallis (13 yrs) survived by his wife Mantha, son Spero (Rocio) and grandson Lazaro. 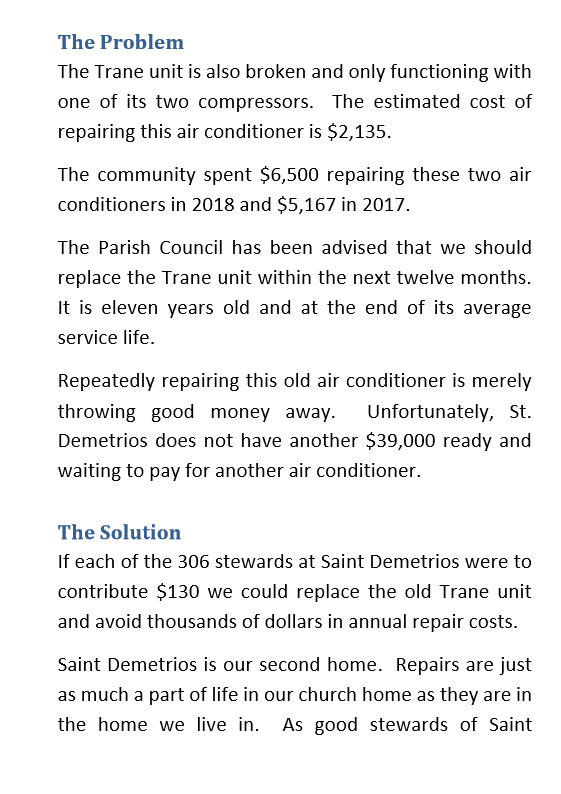 Air Conditioner Replacement We invite everyone to stay for a luncheon next Sunday, March 31. The cost is $10 for adults, $5 for children. 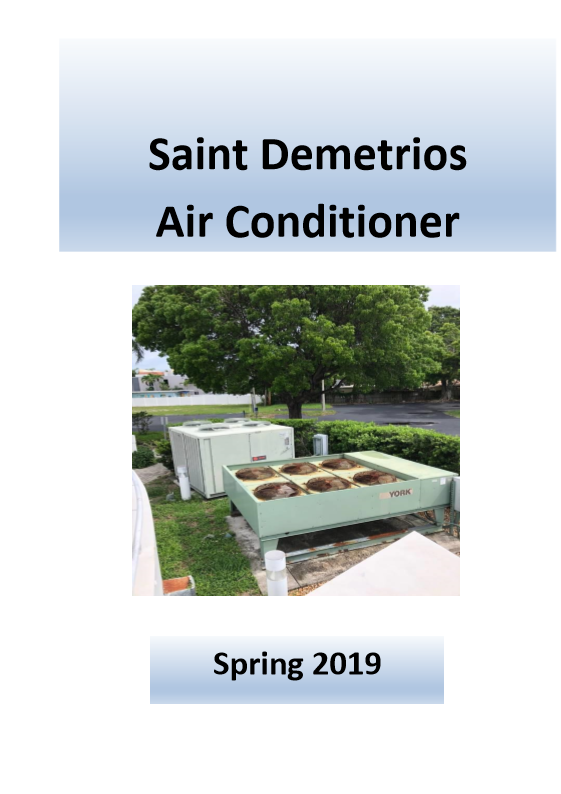 Proceeds will benefit the air conditioner replacement fund. 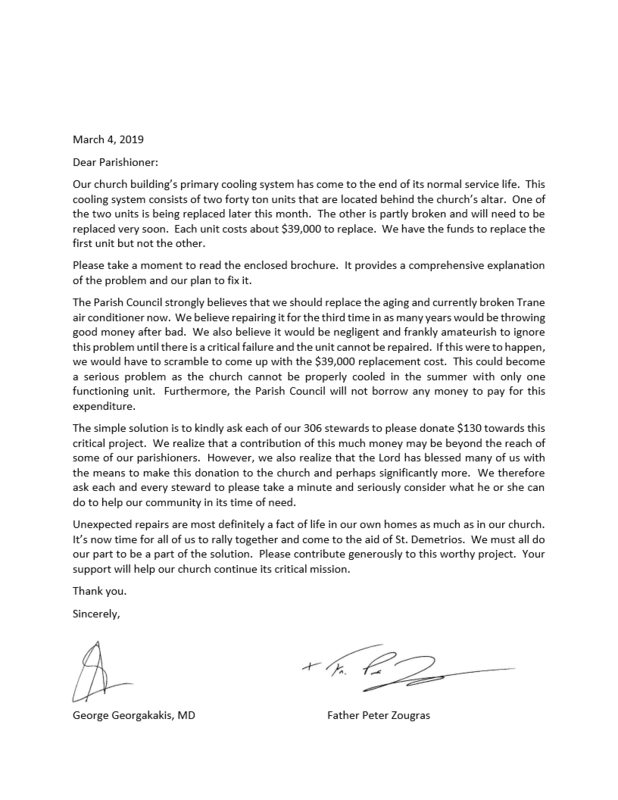 Philoptochos News Philoptochos will be collecting donations for the Clergy Education Fund (Papouli Fund) on March 31 and April 7 in the Kandaras Hall after church services. This fund assists students who are legal residents of the Metropolis of Atlanta and studying at Holy Cross School of theology for the priesthood with a scholarship based on a sliding scale according to the financial need of the student. The second purpose is to provide priests in the Metropolis of Atlanta spiritual and professional growth by continuing education through participation in conferences and other educational programs. Denise Filosofos, Helen Gatsonis, and Athena Loucas will be accepting donations for this worthy cause. The suggested minimum is $10 per person. Coming soon…Philoptochos will be accepting Pascha Orders for Tsourekia, Koulourakia and Easter Eggs on April 7, 14, and 21. More info to follow! Please be prepared to place your orders with payment on those days. 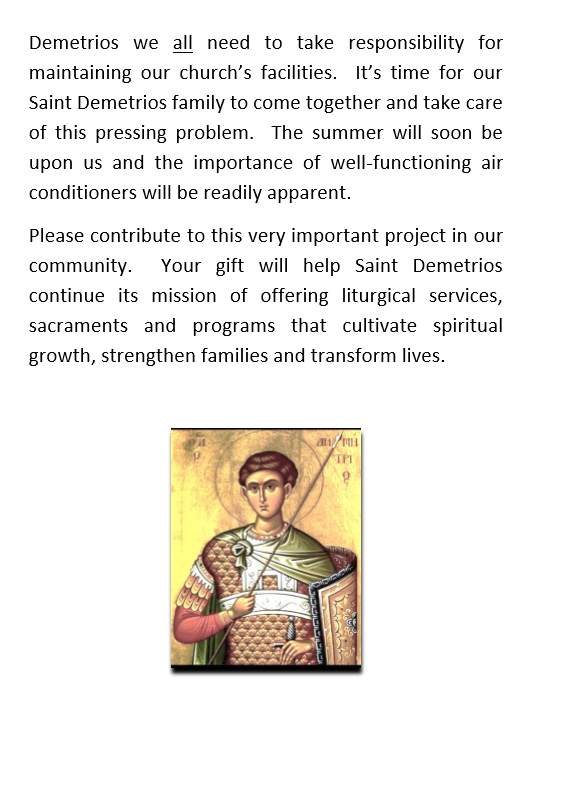 2019 Three Hierarchs Scholarship (THS) Award Application forms for the THS awards of Drs. Anthony and Joyce Kales are available in the Church office. These scholarships are awarded strictly on the basis of meritorious academic achievement for college bound seniors. The academic guidelines for consideration include: Grade Point Average of 3.5 or above; membership in the National Honor Society; a combined SAT Verbal and Math score of 1320 or greater (the combined scores must be from the same SAT exam i.e., scores cannot be combined from two separate SAT exams). ACT substitution for the SAT examination is not allowed. Additionally, the SAT exam can be taken only a maximum of two times. Deadline for submission of application is June 15.